You know I posted a recipe just the other day for some very special cornbread – my Jalapeno Cheddar Cornbread. And declared (oh but I do declare a lot of things – just because it’s my blog, lol) that being a Northerner I liked my cornbread light & fluffy & moist. But ya know what you can’t do with that light & fluffy & moist cornbread? 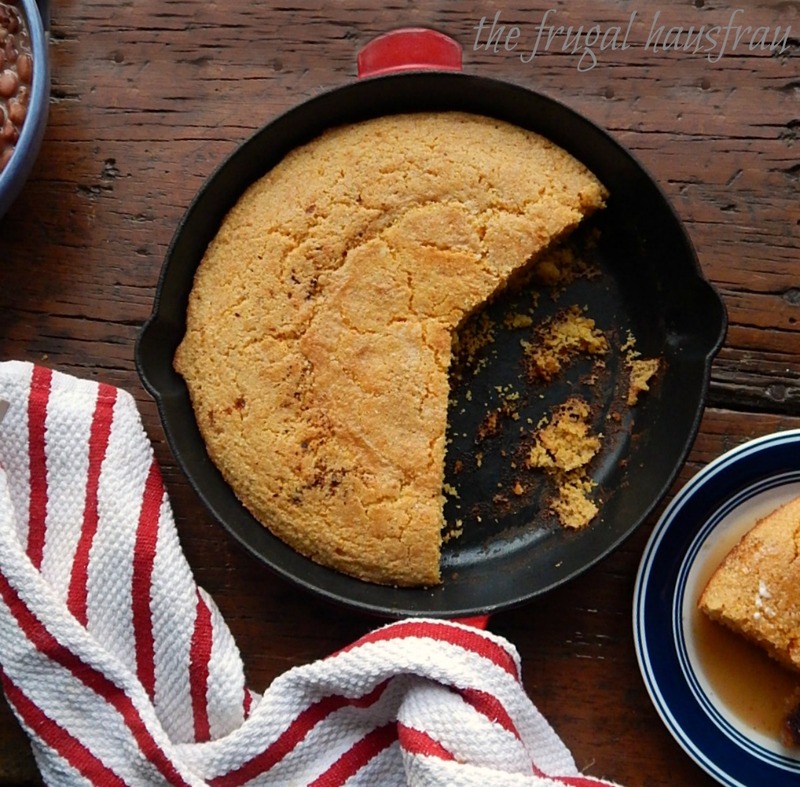 Yeah, ya can’t crumble it into a plate of pintos or a bowl of Smoked Sausage & White Bean Soup, Not like you can with this Southern Skillet Cornbread. If you want to make Cornbread Dressing or Cornbread Salad, you also need this sturdier Southern Skillet Cornbread. You know what else you have to have Southern Skillet Cornbread for? Yeah, you guessed it. Being a Northerner, I don’t know if it’s the “right” or “correct” thing to drench cornbread in butter or syrup, but oh, is it good! Real butter, good syrup. And I do use the bacon drippings in this cornbread. And I had myself a BLT with the bacon. Yum! I did only very slightly adapt this recipe from Sharon, a real-deal Southern blogger at Grits & Pinecones. I’ve had so much fun exploring her blog and 1st came across her on a Pinterest Thanksgiving board we’re both involved in. Take a peak if you’d like to get sucked into Pinterest during your Thanksgiving planning; you’re sure to find some special recipes! Follow us there – it’s only getting better. And follow me on Pinterest here! Add 2 tablespoons of vegetable oil or drippings to a 10-inch cast iron skillet or cake pan, rub it over the sides and bottom, and place in pre-heated oven to heat for five minutes. Add the cornmeal, flour, sugar, baking powder, baking soda, and salt to a large bowl and whisk together. Set aside. In a smaller bowl, mix the eggs, buttermilk, and remaining drippings or vegetable oil. Add the wet ingredients to the dry ingredients and stir to combine, just until the batter is moistened. Do not overmix. Carefully remove the heated skillet from the oven and pour in the batter. Bake for approximately 20 minutes or until the cornbread is golden brown, and the center springs back when pressed. Notes: If you are making the cornbread to make cornbread dressing, let it cool completely and wrap tightly until ready to use, or freeze up to 30 days. I’ll be posting this recipe over at Fiesta Friday Blog Party, hosted this week by Laurena @ Life Diet Health and Trupti @ My Culinary Saga. This entry was posted in Click here for Fabulous Food Posts and tagged Bacon, Bread, Buttermilk, cornbread, cornmeal, Quick Bread, Southern Cooking. Bookmark the permalink. Hi Liz, and I stopped over! So happy to see that marvelous recipe – now I want to change plans midstream, lol! I seriously have Thanksgiving ADD this year!! Can’t decide what to make and jumping from recipe to recipe. Usually I have everything planned out weeks in advance!! I have it easy this year, going to my best friend’s home. Since the group is about half vegetarians I will bring the non-vegetarian offerings…turkey, sausage stuffing, and gravy. The rest of the menu is out of my hands. 🙂 It’s always nice too, to see what other people make, isn’t it! 🙂 Have fun! I’ve been buying Bob Mill’s products on a regular basis and some cookies from a class 🙂 require fine cornmeal. She said the cookies would be too gritty using anything else. All of his cornmeal is stone-ground, just comes in 3 different grinds – yikes I now have four different types. That’s what I buy, too!! 🙂 And I usually just use the fine when I make polenta, too! Thanks much! I like cooking in my cast iron and over the years cook almost everything in it. 🙂 It’s getting heavier, tho, I think!! Looks great Mollie! Bacon drippings??! wow! I tried a new cornbread too this week– with sweet potato (because I had a sweet potato in the fridge). And– Just followed you on Pinterest. You are so right about getting sucked in when there’s other things to do. I can follow Pinterest rabbit trails all evening! OK, hope all’s well up north! hugs! I bet that sweet potato made the cornbread nice and moist and the flavors would marry beautifully! I’ve been on pinterest a lot lately because I neglected it for months…it’s been kind of fun! My pleasure! I made Cornbread Salad with the rest and am so excited to get that post out! Coming soon! That sounds interesting. Looking forward to it! I just stopped by your blog – lovely!! And your daughter has to be the best model ever – adorable! I also saw that Instagram of the Bún chả – I wish there were a restaurant nearby where I could have some!! My mouth is watering! Thank you soo much! You definitely have to visit Vancouver if you ever get a chance to. Soo many varieties of different foods all within a walking distance from each other. It sounds like such a vibrant place whenever I read or hear about it. You are making my cornmeal cravings act up again 😉 I need to put ham and beans and cornbread on the menu! That sounds wonderful!! And of course Ham and Beans are such a great leftover dish! Are you having Ham or Turkey for Thanksgiving? Or both, lol? I know you have big get togethers! Hi, and thank you for another reblog! I appreciate it! I hadn’t made real Southern Cornbread for some time, so it was fun to whip one up! I guess both kinds are good! I have pinned this one to use in my dressing. Yum! I hope you’re going to post it! I’d love to see what you make. I’m hoping to get my sister’s recipe this year…she made it one year when we were in Georgia….and I can’t get it off my mind. It is on my list to post this week. My family thinks that the stuffing is the best part of Thanksgiving. Yes, on the butter and syrup! I eat mine with jelly/jams for dessert. This recipe is similar to my grandmother’s. I was thinking about posting it and this will seal the deal! 😀 Gotta love that cornbread. I’d love to see your Grandma’s recipe, too! Jelly or Jam sounds great and I’d go have a slice just to make sure but I just made Cornbread Salad! I have GOT to stop thinking about that in the fridge, lol! You gotta use the bacon drippings! And the cast iron is a must for this type. Perfect recipe! Great! I’m so glad I did right by it, lol!! 🙂 It was so good with those Pintos I made, too, btw!